Mid-autumn fest is just around the corner! Have you plan your mooncake spree? I you wanna find something new, here’s one to share with you. This is a mooncake from Hong Kong and it’s called “Maxim’s” or 美心in Chinese. Founded since 1956 which is the same age with Malaysia! Other than mooncakes, Maxim’s Group also offers a range of festive products, spanning from Chinese New Year Puddings, Rice Dumplings to Chinese Preserved Meat.Kindly check on the page link at the end of this post. The ambassador is Cool 魔Chilam Cheung!! In case you watched 《衝上雲霄II》 which is a hot topic lately!!! Maxim’s mooncake is now in Malaysia with their 100% made in Hong Kong exquisite mooncakes which include traditional baked series and signature snowy series. Checkout my favorite and recommended piece! The series include lotus paste (with or without salted egg yolk), low sugar white lotus paste (with or without salted egg yolk), mixed nuts, red bean paste and premium egg custard. The lotus paste filling is made from lotus seed from Hunan in China. I like that they had the low sugar one as I can indulge in my mooncake without much guilt. The smooth lotus paste filling with olive seed provided a nutty taste and crunchiness. Take a huge bite and you will have a mouthful of almonds, walnuts, olive seeds, sesame and melon seeds. I love the pleasant nutty taste and the chewiness of this. It tasted like kum tui “金腿” with the winter melon thingy. My mom and dad gotta love this!!!! For best consumption, please reheat it in microwave for 10 seconds before serving for the best taste and soften the center part. Snowy Series is one of my all time favourite! Simply because the lovely pastel colours and the chewiness of the skin. Just like eating Muachi!!! But I have to give credits to Mei-Xin’s Snowy Series as I find that the skin is very chewy compared to others. Last year, Mei-Xin’s Snowy Series was voted as “Most Chewy Crust” and “Overall Most Tasty Snowy Mooncake” in Hong Kong. All Mei-Xin’s snowy mooncakes are made from only natural ingredients and no artificial colouring is added. If you were to ask me which one is the best, I can only say I love all!! But of course a chocoholic like me will still go for the “DEVIL” which is made from imported premium chocolate with a hint of crunchiness lies within the filling! p/s: Cool 魔Chilam Cheung's favourite is the Blueberry Duo! 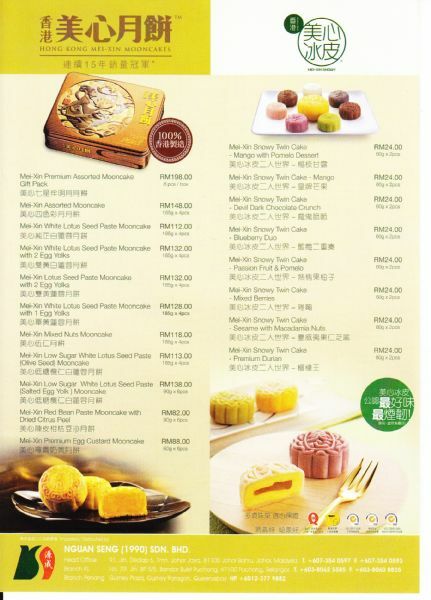 Check out the price list of Mei-Xin Mooncakes. Experience a different mooncake festival this year with Mei-Xin moonckaes specially flown in and “100% Made in Hong Kong”. Mei-Xin Mooncakes are now available at Private Kitchen, AEON and Jaya Grocer.